The Vancouver Sun / Province is reporting that "A Courtenay man, convicted in a case in which more than 30 restricted firearms went missing, has had his sentenced reduced by 10 months to 30 months in jail following an appeal." There are several layers to the story. Keith Fraser goes on to report that "In November, B.C. Supreme Court Justice Robin Baird sentenced Bryce Cameron Scott McDonald to 40 months in prison after he had been found guilty of 12 criminal counts. Most of the offences dealt with the gun collector’s failure to properly secure seven registered firearms which were seized by police when they raided his home in December 2013. One of the guns was loaded and found in his bedroom. For that offence he was sentenced to 40 months in jail, with the sentences on the other counts running concurrent to it." The first layer to the story seems questionable. If someone has a legally obtained firearm and it is found loaded in his bedroom, that is indeed unlawful storage of a firearm but is it really worth going to jail over? I think not. Gun advocates argue that the laws should be framed to deal with the use of guns to commit crimes not for simple possession which in the United States is a constitutional right. This is why I was outraged with Stephen Harper's wording of the new law. Stephen Harper introduced mandatory minimum sentences not for the use of a firearm in the commission of a crime but for simple possession. Like WTF? Why the hell did he get rid of the long gun registry if he was going to introduce mandatory minimum sentences for simply possession of a firearm? Even Trudeau didn't do that. The next level of the story reveals that he was a Hells Angels associate. Oh well that's different then. But is it really? No it's not. If anyone is caught with a loaded gun in their bedroom, I do not think they should go to jail for that. They should get a warning or a ticket. That is all. If someone has a loaded gun in their bedroom there isn't the intent to use that gun to rob Macs or use it in a drive by. If someone was going to rob Macs or us a gun in a drive by there is no reason they couldn't store it properly then load it on their way out. Having a loaded gun in your bedroom is obviously for self defense. However, there is a third level to the story that changes everything. 30 guns he legally obtained went "missing." The fact that he was a Hells Angels associate and 30 guns went missing is highly suspicious to say the least. Especially since he was found in possession of crack cocaine with the gun seizure. The crack cocaine offense was good enough for him to lose his firearm license all on its own. Clearly this guy is now on the police radar. Previously Kim Bolan reported that "Police began investigating the Vancouver Island man after the Integrated Homicide Investigation Team was tipped off to the location of a bag of guns near 76th Avenue in Surrey on Sept. 17, 2013. The RCMP located this bag and one of the three firearms inside it was traced back to Mr. McDonald. He had purchased it, the police discovered, sometime in 2011,” Baird noted in his earlier ruling." 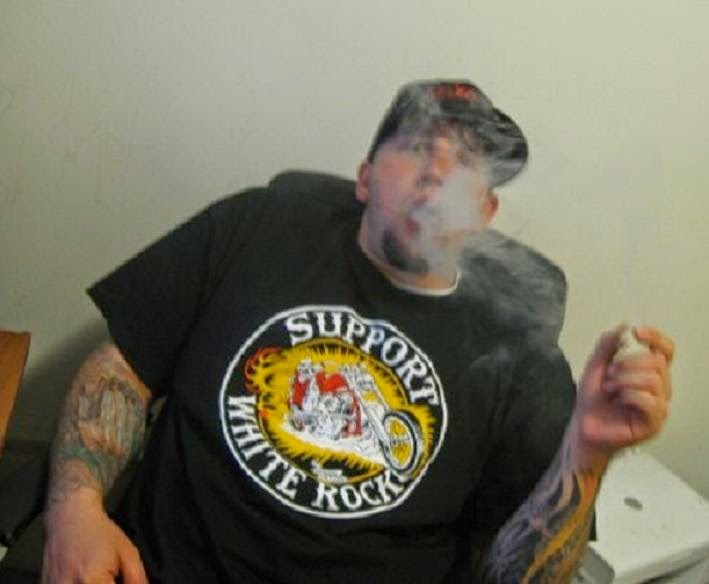 So a bag of firearms from a Hells Angels associate on Vancouver Island is found in Surrey. How is that not related to the recent gun violence in Surrey? Please advise. The guns were found in Newton. The Hells Angels have been aggressively involved in the Surrey drug trade ever since the Surrey House of Horrors. Wake up and smell the coffee.